In 2001 I decided to completely reinvent the technology of interstellar travel and the whole notion of interstellar civilization. I wanted to create a possible, hard-sf society that spanned multiple stars using slower-than-light travel. I found a way to do that. And I wanted to set a classic space-opera in this new world. So I did that. What had been bugging me for a few years was the lack of innovation in SF in the area of space. There's been a kind of revolution in the nanotech and genetics--"squishy" technologies that have influenced people like Linda Nagata and William Gibson. But in space... well, most writers still use hyperdrive, or wormholes, or Bussard ramjets, don't they? There's an unspoken assumption that slower-than-light travel is just plain unsexy--not suited to writing really interesting deep space stories. So I wanted to drag the interstellar travel story kicking and screaming into the 21st century, using recent developments in hard science (some of which, I freely admit, are the work of other hard SF writers, most notably Geoffrey A. Landis). Permanence is set in the universe as we have only recently come to understand it; that universe is quite different than we'd assumed even ten years ago. The stars are not alone in the sky. In the darkness between them, countless other objects can be found, if you know how to look for them. There are orphaned planets, possibly dozens of them for every star we see. And there are the brown dwarfs. To my mixed delight and consternation, I found that nobody seemed to be writing about brown dwarfs--those objects too big to be planets, and too small to be stars. We've discovered recently that they are as common as the visible stars. It's likely that there's one closer than Alpha Centauri--maybe much closer. And brown dwarfs are massive enough to have incredibly powerful magnetic fields; if they're young enough, they're hot enough to warm any nearby satellites to Earth-like temperatures. They are, in other words, invisible suns between the suns. For me, that makes them objects of infinite fascination and potential. Yet nobody seems to have picked up on that potential. So I wrote Permanence. This book lays out the possibilties in as much detail as my impoverished imagination can handle. The brown dwarfs are the key to making interstellar civilization possible--the dwarfs, and a starship technology designed specifically to exploit their strengths and ubiquity. This new kind of starship is the interstellar cycler. All this technobabble aside, what I was happiest with in the novel was the characters. The alien worlds of the Halo are inhabited by perfectly human beings--for instance Meadow-Rue Rosebud Cassels, who sets the whole plot in motion when she runs away from home and discovers a derelict cycler on the way. All Rue wants in her life is a little stability, but she gets sucked into an ambitious plan to board and salvage the cycler... and that's all I'll say. Permanence was very different from my previous novel, Ventus. It has a smaller cast, it's almost entirely set in space, and the events of the novel take place over a span of several years. In many ways the "star" of Ventus was the planet itself, and there's no comparable single world to anchor the events in Permanence. So I didn't know whether people who'd enjoyed the first novel would be disappointed by the second. It seems I needn't have worried. 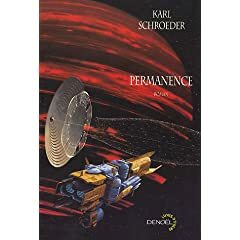 Scifi.com called Permanence "an exciting romp worthy of Heinlein", and declared (via a tortuous double-negative) that the novel has "an incredible amount of excitement and intellectual riches in its pages". Faren Miller gave Permanence top marks in the May, 2002 issue of Locus, ending by saying "Anyone who still thinks the heyday of intelligent SF adventure fiction ended with the passing of Heinlein and Asimov should give this book a try. I think they'll end up up agreeing that galactic civilizations may tumble and Gibraltars may crumble... but Schroeder is here to say." Nick Gevers, in another Locus review, said, "Not since David Brin conceived of his Uplift Universe has an SF writer considered these matters with such cogency". Kirkus Reviews called the book a "thoughtful, well-informed, insightful work, with a sharp yet subtle political subcontext." And Publisher's Weekly (April 15, 2002) said that "the narrative fairly bursts with interesting ideas". Ernest Lilley at SFRevu.com said "His first book, Ventus, was good enough for me to worry that he couldn't do it twice, but Permanence shows that he's here to stay, and getting better every time." "Schroeder's excellent novel is the best kind of coming-of-age tale, one that seizes the imagination and the emotions as it presents a fully realized future society, fascinating technology, and believable characters." I won't pretend that these reviewers didn't have some criticisms. Publisher's Weekly said that "the result too often resembles digressions that belong in an anthropology study," and scifi.com suggests that the book might be a bit too long. I'd be the first to admit that the book has everything in it but the kitchen sink, and some readers may prefer more streamlined tales. Letting the narrative stretch out a bit allows me to have some things that you ordinarily don't find in so-called "hard" science fiction. As scifi.com put it, "affairs of the heart and soul are hardly neglected among the intellectual turmoil. Rue herself, onstage for most of the book, is a charming heroine who undergoes real changes over the years of action which the book encompasses. Her love affair with Bequith is a subtle entanglement and simultaneous disengagement, as neither one really knows what drives them. And all the supporting players are nicely developed as well..."
...And then it got really fun. Astrophysicist Milan Cirkovic wrote an article about the ideas in Permanence for the prestigious Journal of the British Interplanetary Society. The JBIS has been around for seventy years or so, and is the ultimate Geek newsletter. This is the journal where the space age was conceived and its core technologies initially proposed and debated. The fact that my ideas on Fermi's Paradox were being discussed within its pages thrilled me beyond description. The article was pretty in-depth as far as the implications of my ideas go. This is Milan's home turf, after all; he's devoted a fair amount of paper himself to studying why we appear to be alone in the galaxy. And he has better credentials. Another important feature of Schroeder’s solution is that, contrary to what astrobiologists and SETI researchers usually assume, the speed of evolution in a given locale is unimportant for determination of the number and age of accessible alien civilizations. It has been usually assumed that fast evolution (similar to the techno-evolution we perceive on Earth in last several centuries) will cause civilizations to evolve up the ladder of Kardashev types: from Type I (more or less similar to the present-day human) to Type II (capable of building a Dyson sphere and marshalling all resources of its planetary system) to Type III (pan-galactic civilization spanning many planetary systems and managing resources on the galactic scale). Schroeder dispells this illusion: in his picture, faster the evolution, faster is the devolution of a species into the non-conscious state. I suppose that makes sense, given that most of the characters in Permanence find them depressing as well. I don't personally, and don't find anything nihilistic about my ideas. On the contrary, to suggest that intelligence and consciousness are just another feature of the natural world is liberating, to my mind. It places us with the things of the world, not against them. Implications aside, the article was fascinating for its elaboration and deepening of my own rather sketchy notions. I've since developed a friendship with Milan and consider myself privileged to be taken seriously by such intellectual heavy-hitters as the JBIS crowd. Permanence won Best English Language Long Form in the 2003 Aurora Awards. The Auroras are one of Canada's two top honours for SF and Fantasy writing. Permanence was also shortlisted for the other award, the 2003 Sunburst. The awards ceremony was held at the Royal York Hotel's concert Hall, Saturday August 30 at 1:00 p.m. With a large and enthusiastic audience and the charismatic Marcel Gagne as master of ceremonies, the event went off like clockwork. I hadn't expected to win, so had no prepared speech; I winged it when I got up to the podium, with apparent success. I dedicated the award to my daughter, Paige, who was in the audience with my wife. Thanks to everyone who helped craft this novel; I am not alone in deserving the award.